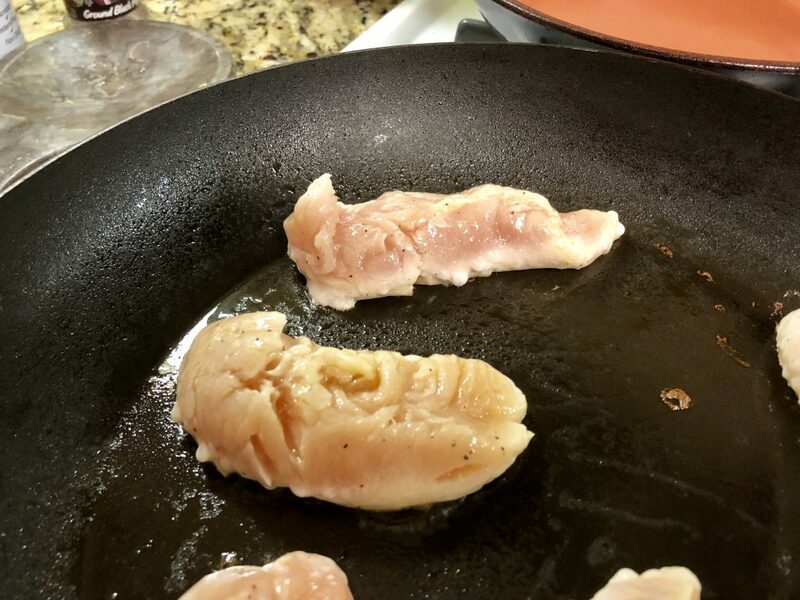 Cooking boneless chicken breast on the stove is one of those funny things that sounds really straightforward but can be totally intimidating. How do I make it interesting? How do I know if it’s cooked? How can I make sure it doesn’t dry out? So let’s dive in to marinades, cook times, what to do if the chicken breast is large/thick. 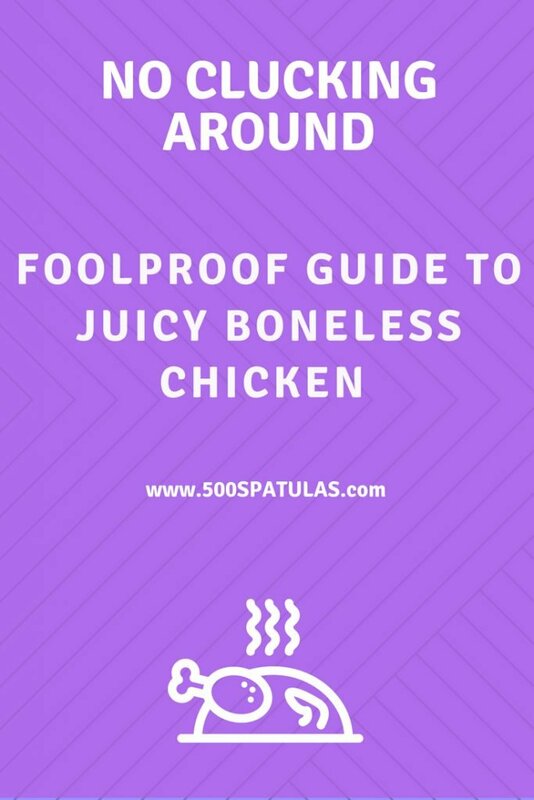 By the end of this post, you will hopefully feel eager to go cook some delicious, juicy chicken! One of the biggest keys to juicy chicken is marinating it. 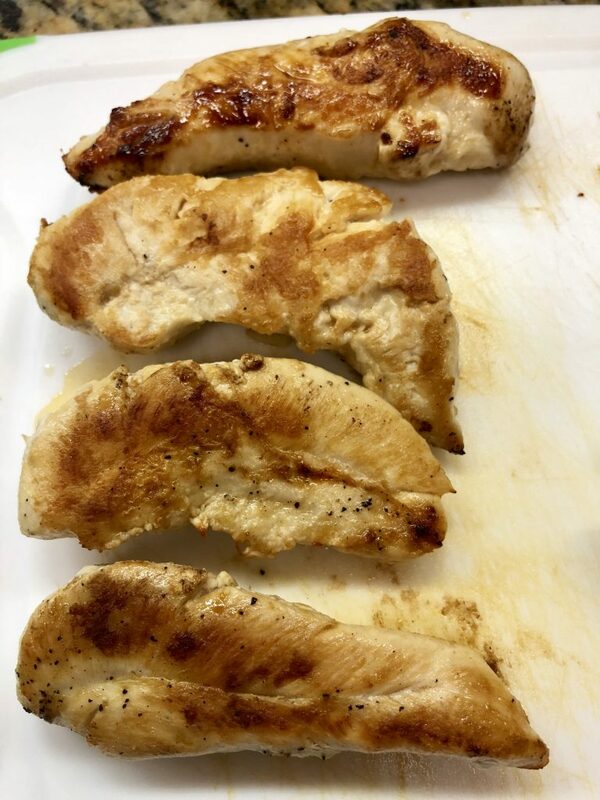 For all chicken marinades, I throw all of the ingredients (and the chicken) in a large ziploc bag in the fridge for 1 – 12 hours. These marinades are based on ~1 lb of chicken breast and are meant as foundation recipes. Get creative and tweak based on what you’re serving or what you have on hand. 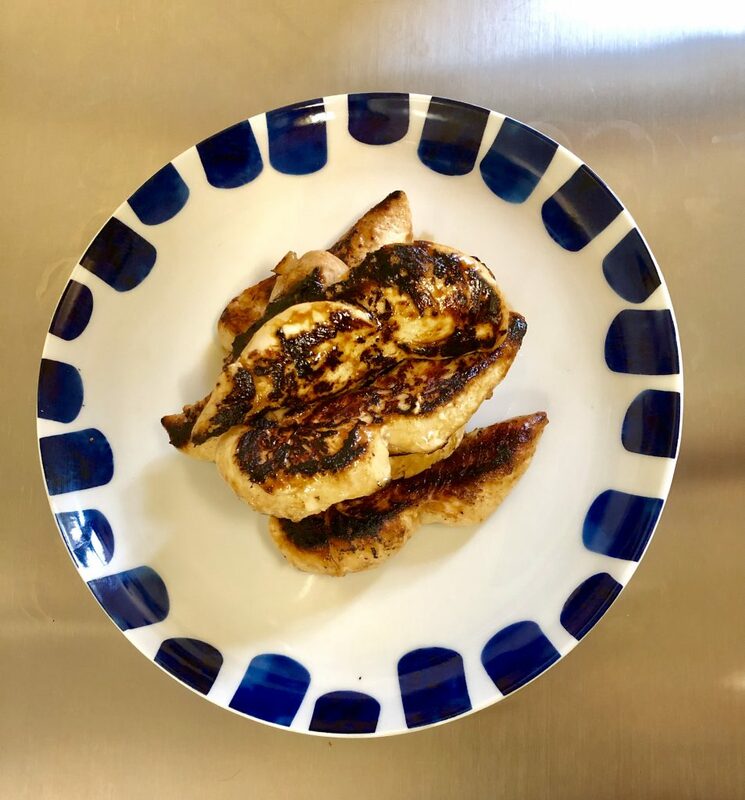 You always need some oil, something acidic (the lemon juice or a vinegar), something salty (the salt or soy sauce), and some garlic (if you don’t have fresh on hand, throw some garlic powder in there). Cook times will vary based on the thickness of the chicken cutlet. Below I will focus on boneless chicken tenders, thin boneless chicken cutlets and full size boneless chicken breasts. Heat 1 teaspoon of olive oil in a skillet over medium heat. 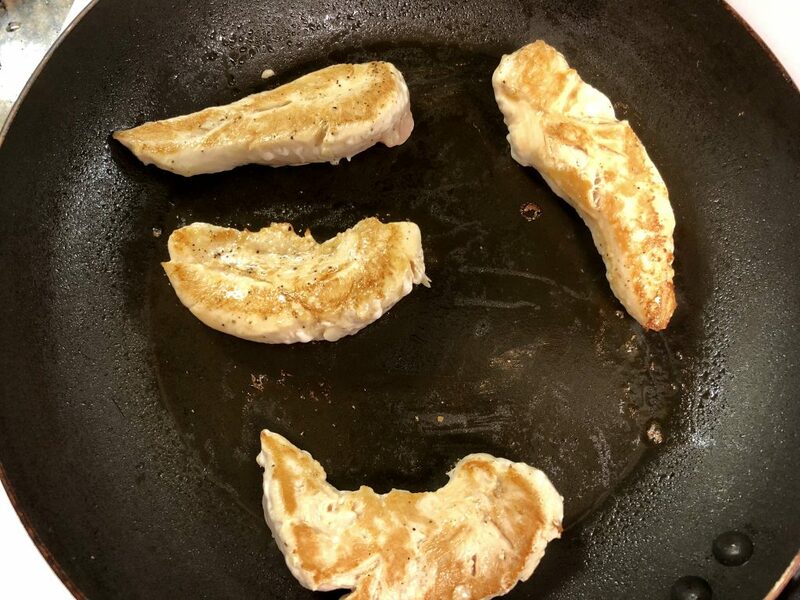 When the pan is hot, place the chicken cutlets in the pan and cook until the edges are opaque, about 2 – 5 minutes. Flip over using a fork and cook another 2 – 6 minutes. With tongs, check to see if the meat feels springy and check with a meat thermometer*. Once the internal temperature of the meat has reached 165 degrees, the juices will run clear and you’re good to go. Always check the thickest part of the meat. Once cooked, let rest on a cutting board for 5 minutes prior to serving or slicing. Heat 1 teaspoon of olive oil in a skillet over medium heat. When the pan is hot, place the chicken cutlets in the pan and cook until the edges are opaque, about 2 – 5 minutes. Flip over using a fork and cook another 2 – 4 minutes. With tongs, check to see if the meat feels springy and check with a meat thermometer*. Once the internal temperature of the meat has reached 165 degrees, the juices will run clear and you’re good to go. Always check the thickest part of the meat. Once cooked, let rest on a cutting board for 5 minutes prior to serving or slicing. Preheat oven to 400 degrees. Heat 1 teaspoon of olive oil in a cast iron skillet (any stove & oven safe skillet works) over med high heat. When the pan is hot, place the chicken cutlets in the pan and cook until 3 – 4 minutes. Get them to almost the color you want when eating. Flip over using a fork and cook another 3 – 4 minutes. Transfer the pan into the oven and bake for 15 – 20 minutes depending on how large the breast is. Check with a meat thermometer*. Once the internal temperature of the meat has reached 165 degrees, the juices will run clear and you’re good to go. Always check the thickest part of the meat. Once cooked, let rest on a cutting board for 5 minutes prior to serving or slicing. *I would highly recommend purchasing a digital thermometer. It takes the guesswork out of cooking and makes it a lot safer (buh-bye undercooked chicken). You DO NOT need a fancy one. I like the GDEALER thermometers, specifically the GDEALER Instant Read Thermometer–it’s easy to read, store, and if on some day in the future I accidentally drop it into a vat of bubbling caramel, I’m not going to weep over the price tag of replacing it. It also has a handy cheat sheet of safe temperatures for different meats right on it! Disclaimer: This page contains affiliate links, meaning I may receive a small commission if you click on and purchase items I’ve recommended. Using these links will NOT cost you any extra money, but does help to keep 500 Spatulas up and running. Recommended products are based on my own opinions and are not sponsored. Thank you for your support!